Many investors are seeing profits in the US luxury market but can you really flip a luxury home? A luxury home is defined as a real estate market niche targeted to high net worth individuals. Of course, the term "luxury" differs among different countries, counties and cities but for the Palm Desert in Palm Springs area, luxury homes tend to be at least 4000 ft.² and price over $1 million should. Many characteristics divine luxury real estate differently based on the property value and comparison to other properties in the area. 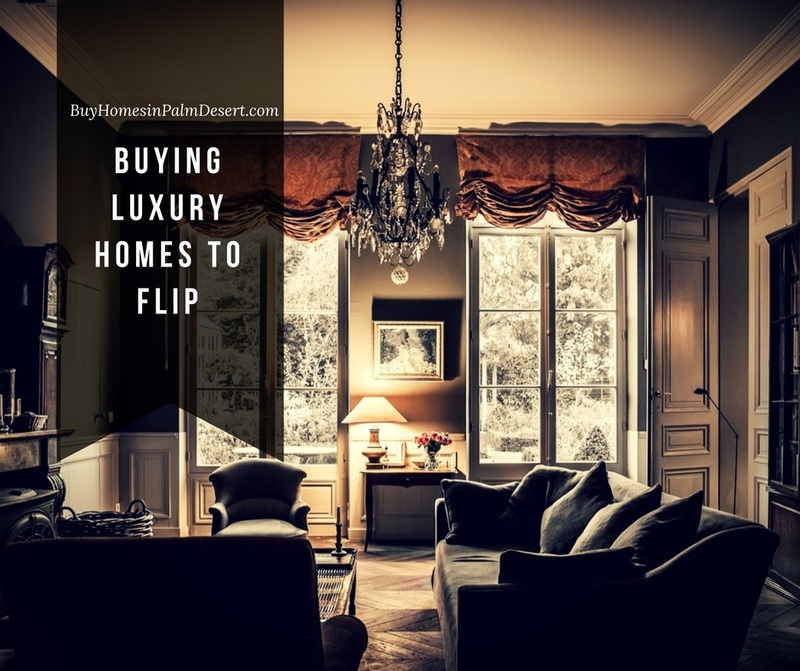 Buying a luxury home to flip is different than a traditional home. Most investors look for the worst home in the best neighborhood whereas luxury home investors find the neighborhood and then find a home within the neighborhood that meets certain requirements. This type of investing and flipping to sell has really taken off in the US., High-end homeowners can foreclose or short sale their property and this is a great opportunity for investors to swoop in, by the home in a discount and turn around and sell it for a higher profit once it's been fixed up and meets its value. One important thing is that luxury homes get a lot of press. You can fairly easily find a rehab property but finding a luxury one is usually high on the market. It's easy to get high exposure when the agent has something that publications and press want to show off. Consider the neighborhood as well. With high-end properties, high-end neighborhoods and communities. Many buyers will drive through the neighborhood stating, "I want to live here!" Safety, gated communities and security all are important when buying and flipping a luxury home. Typically luxury home rehabs take less work and were originally built using quality materials. However, if these quality materials were damaged and need to be replaced, replacement items could be just as expensive if not more. When looking for a house to rehab you'll always want to think about building to the property values in the neighborhood. If you go overboard with your rehab you may not be able to sell the home at the price you need to make a decent profit. No buyer is going to pay hundreds of thousand dollars over the next highest priced home just because you have flipped it. One positive thing about flipping luxury homes is that you can stand to make a lot more money than you can flipping houses in a lower price range. But, you will probably also spend more in the rehab process. It's not uncommon to spend over $100,000 into a million-dollar flip but when you sell it for $1.5 million, it makes a lot of sense. For more information and tips to finding the right house in the right luxury neighborhood, contact my office today. I help investors every day find a home in the right neighborhood to make them a profit quickly and effectively.